Luis Alberto Perez Velarde, curator of the Museo del Greco, spoke about a series of 13 paintings known as the Apostolate of the Museo del Greco. This series consists of half-length portraits of Jesus and the 12 apostles (with Paul replacing Judas). El Greco and his workshop actually produced two other versions of this series which are now at the Asturias Museum of Fine Arts in Oviedo (done 1602-1607) and in the Toledo Cathedral (done 1607-8). Interestingly, the series at the Museo del Greco which dates to 1610-1614, is mostly unfinished. We can then compare these in progress portraits to the other completed sets. I thought one of the most striking examples was the portrait of Saint Matthew. As one of the evangelists, he is shown holding a book and quill. His right hand is simply a wash of flesh-tone color under the book. The typical, long fingers of El Greco’s figures will clearly be a later refinement. The Saint’s face and beard are also a ghostly approximation. It’s as if we were looking through obscured glass at the man. The tunic and cloak are flat with sharply contrasting areas of light and dark missing the eventual blended progression from one to the other. 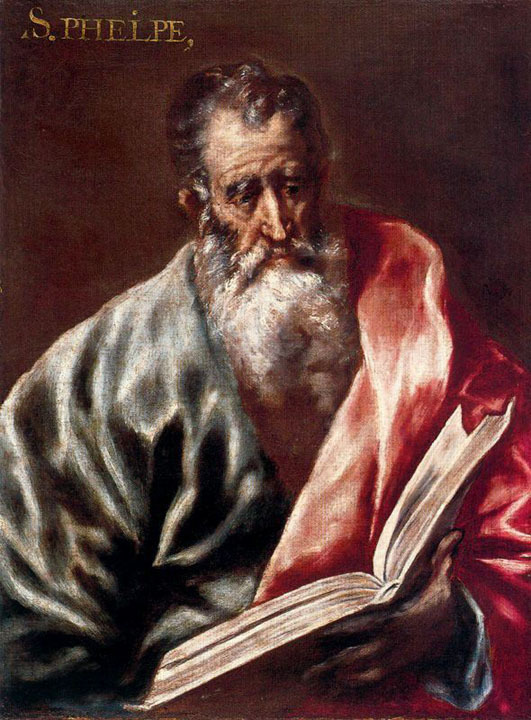 The completed versions of Saint Matthew don’t have these unresolved areas. El Greco – San Mateo, Toledo Cathedral. 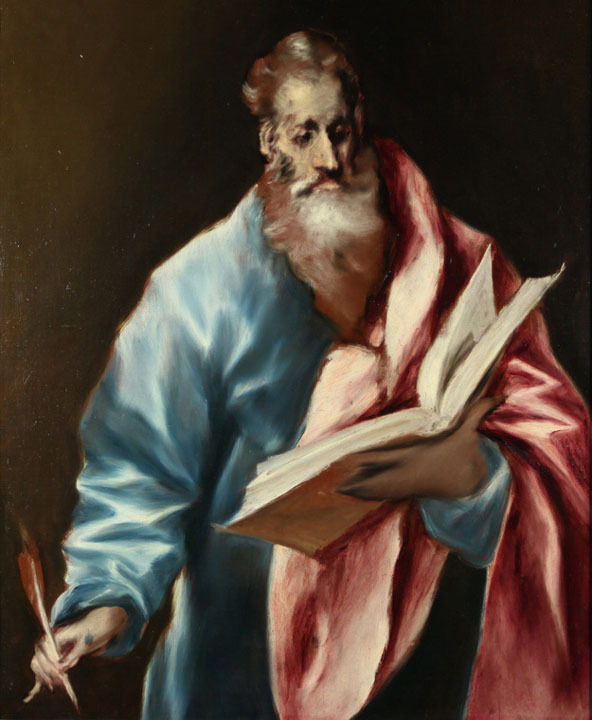 The Saint Matthew paintings are a fascinating glimpse into El Greco’s creative process. The prevailing Italian and Spanish method at the time was to prepare a detailed under-drawing on the blank canvas which enabled fairly exact work once painting began. It was also not uncommon (especially in Spain) to complete an entire monochromatic under-painting as a guide for the final work. 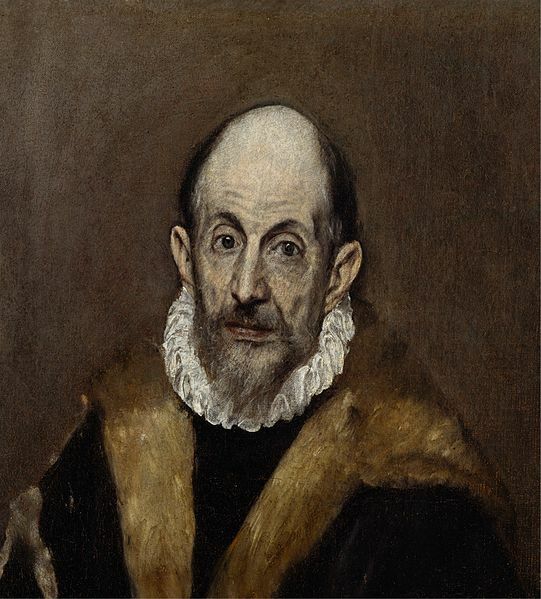 By creating a fleshy colored hand “zone” and just the darkest and lightest regions of the clothing, we can imagine that El Greco worked quickly and directly on the canvas. Without detailed under-drawings, he appropriated areas for the final image and then iteratively refined each element as he went like a sculptor slowing carving in the round. The dynamic contrast of light and dark seen in El Greco’s work is therefore a result of how he worked refining areas of the canvas by building up layers of definition. The obvious brush strokes are not because he was trying to remove the realism and blur the image, it is because he held back and didn’t get close enough to realism. El Greco was very much ahead of his time in how he approached art. We can see his influence particularly among the Impressionists and Expressionists – movements that occurred more than 250 years after his death. Perhaps seeing his legacy, relevance, and appreciation today is the most fitting tribute on this 400th anniversary of his death. Very interesting to see El Greco’s creative process.